Hello I am Fenny from f4fabulous and this post is my first guest post at Simply Hue. I am so honored to be a guest poster in a blog that I've admired very much for a long time. I am very much a beach person. I have visited many beaches in a few different countries, but I am still deeply in love with Bali beaches. Bali is one small island among the 17 thousand islands in my home country, Indonesia. It is blessed with white sandy beaches, beautiful scenery, rich culture and also many talented artist. Balinese themselves call Bali 'the Island of the Gods'. 2. Beaded necklace via Erickson Beamon (Net a Porter) and this is really a splurge. But trust me, in Bali you could find the similar design with a very affordable price - sort of a teaser for you :). Handmade Balinese lace umbrella via Uluwatu. It is a homegrown boutique which specializes in delicate handmade lace sewn by old an old-fashioned sewing machine. I hope you enjoyed my post today and I'm looking forward to sharing my next traveling mood board with all of you again. 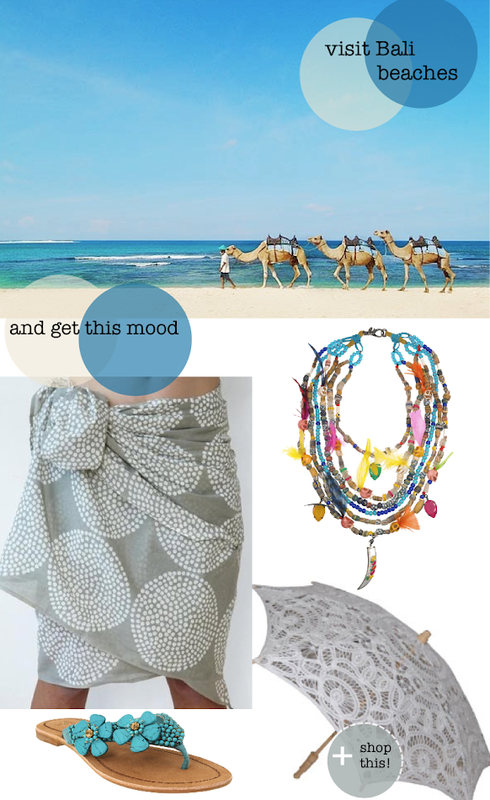 Love the sarong and the necklace: here it's only 32 degrees Fahrenheit (or O degrees Celsius), so it's really freezing. Thanks for adding some warmth and colour to my day!